America lost a great woman this week. I voted against Barbara Bush’s husband twice. I slowly started liking her throughout her husband’s term, and my fondness of her has continued to grow. Because of her, I think more of him. I voted against her son, George W., twice also. I like him more than I once did as well, though I split much of the credit for that between the first Mrs. Bush and another one. All greatness aside, she was comfortably familiar to many of us. She’s like a special lady to me who has been gone for a long time and who I miss terribly. I bet many of us can say that. I wonder what Mrs. Bush would say, in private of course, to our nation’s leaders today. If only she could talk to them, and if only they were able to listen. The United States joined forces with France and the UK in a mission to bomb Syria. It was in response to another chemical weapons attack by Syrian President Bashar al-Assad on his own people. It’s barbaric behavior that crosses a line for most. Vice President Mike Pence spoke about the attacks while he was in Peru filling in for the president. Many of his comments sound like they came from someone who was not Governor of Indiana in November of 2015. That was the month he decided to block Syrian refugees from coming to the Hoosier state. The premise of Johnson’s article was the confusion that messages like this cause. These compassionate sounding words and the tone in which they are intended don’t match the administration’s actions. However, what frustrated me about her coverage was the lack of emphasis on Pence’s own hypocrisy on the matter. Less than three years ago, and for almost two years of legal battles that followed, this man wanted to keep Indiana from helping these same people by allowing them entry here as refugees. It’s as if it is morally correct to respond to the violence they face with violence of our own. But giving them a safe place to exist, of which we have an abundance of here, is not. Our nation has only allowed 44 Syrian refugees into the country since October of 2017. That is a political decision made at the highest levels of our government by Pence, President Trump, Trump aide, Stephen Miller and others. This is the morally “wrong” act to take. Mrs. Bush might say to these men, “let’s judge a man by what he’s done.” She actually did say that one. America has more to offer Syrians than bombs. We have the capacity and willingness to care for far more of them than we do right here, where it is safe. We should. Let’s offer that help before that tyrant kills more of them, not after. In 1989 regarding a different crisis, she wisely said “you can hug and pick up AIDS babies and people who have the HIV virus.” Her words helped us with our fear. We didn’t need to be scared of AIDS victims then, and Americans don’t need to be scared of refugees now. She might remind our leaders as she had said before to “never lose sight of the fact that the most important yardstick of your success will be how you treat other people…along the way.” How do we measure toward Syrians? I bet she would make it simple. Because it is. Blowing things up in Syria because Assad killed children and civilians who we actively chose not to help does not make us morally right. We shouldn’t pretend that it does. 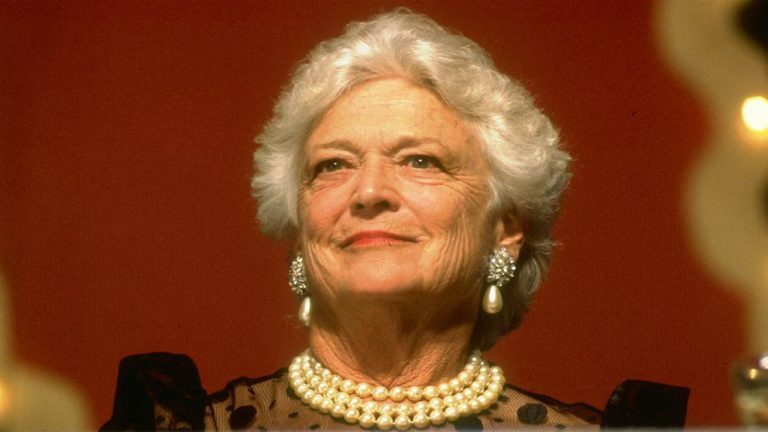 We celebrate Mrs. Bush on the week of her passing by remembering the best of her. I wish we would celebrate our great people when they pass by renewing our understanding of the lessons they taught. Hers were so useful and simple. Simple enough to be understood and used by Mike Pence.